Home » Blog » Team Building Activities: Société Générale enter the Dragons Den! 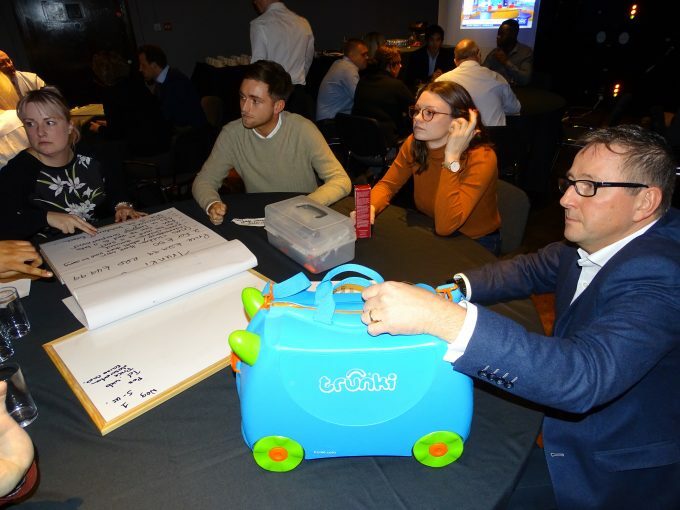 When Société Générale approached us looking for a team building event that would get participants working together but also thinking about presenting their ideas in a dynamic way, the Den of Dragons team building activity was the obvious choice! The event was held at the amazing Churchill War Rooms in London which is a venue that never fails to impress. The atmospheric and industrial Harmsworth Suite with its huge steel beams and original circuit breakers and switches provided the perfect backdrop for this event. Once guests had finished their morning meeting, our team accessed the room and had 1 hour to set up for the team building activity whilst the delegates enjoyed their lunch. With the set up complete and the Dragons Den theme tune playing in the background, delegates started to make their way back into the room after lunch. Once everyone was seated, the challenge was set! The first task facing the teams was earning some much needed ‘development funds’ that would help them launch their ‘big idea’ to the World. To do this teams selected an existing product from our Dragons Den Hall of Fame and were tasked to sell as many as possible during a ‘live’ shopping channel broadcast. The more they sold, the more capital they had to invest in their own ideas! Next, it was time for the main challenge! Teams had to come up with their own unique idea that they were going to pitch to the panel of Dragons. 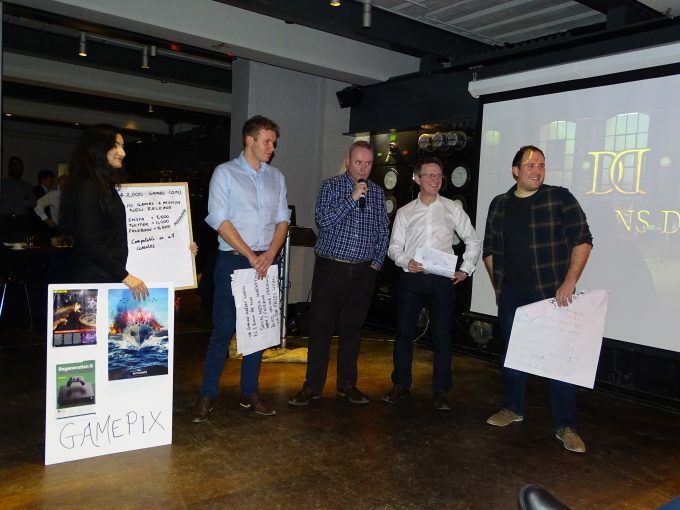 As well as a great idea, teams also needed to develop a solid financial plan, a strategy to bring their product to market, and a mind-blowing pitch that involved every member of the team. Teams were given 45 minutes to come up with their idea and plan their pitch. They were also given access to plenty of creative materials which could be used to enhance their presentation. Once the time was up, teams entered the Den one by one to pitch to the Dragons. They had just 3 minutes to get their ideas across and secure investment. The Dragons on this occasion were Directors from Société Générale and they certainly put the teams through their paces. There were some superb ideas that came out of this team building activity and but most importantly, the teams worked together brilliantly and produced some great pitches. This entry was posted in Team Building Activities and tagged Team building activities, team building events, Corporate Team Building Activities, benefits of team building, planning a team building event, Team building ideas, Indoor team building, dragons den, den of dragons. Bookmark the permalink. ← Team Building: The benefits of mobile team building activities!